Why Bother With a Keyword Map? Because you need a plan or you’ll have no idea where you are going. Before you set goals for your SEO campaign, you need to know the following. How much search volume there is to support your strategy. Where you want to be positioned in your industry. A clear map should answer these three needs so that you can set better expectations for your SEO campaign and what kinds of content you’ll develop as part of your ongoing on-site and off-site optimization strategy. Implementing a keyword map helps search engines better understand what your page should rank for. What’s more, page-level keyword targeting is the third most important ranking factor in Google’s algorithm according to Moz’s 2015 Search Engine Ranking Factors survey. What’s this mean? For example, let’s say I owned and operated a phone accessory e-commerce store called Add-ons & Embellishments. If my home page title tag read, Home | Add-ons & Embellishments, I’ll probably rank well for my brand name, but I’d be at a disadvantage if I wanted to rank for “phone accessory” related keywords. Why does this matter? Because unless you’re a huge brand (or in a very small niche), there are far more people searching for what you sell than there are people searching for your brand name. Here’s what a slice of Add-ons & Embellishments’ keyword research might show. Keyword mapping also allows me to position myself in the phone accessory industry based on the type of products I sell. For example, the keyword universes will be different for deluxe as opposed to discount providers. Targeting relevant price variants will mean you’re targeting lower volume (but more relevant) traffic. In addition to mapping keywords to pages based on a searcher’s intent, a keyword map gives you the option to develop your website directory and structure. Say my website navigation is organized like so. But, after doing my keyword research I see that there is significant search volume in accessory categories. That being the case, I’d decide it will be better for my SEO, user experience and content if I organize my website by accessory type rather phone types, like so. Adds more opportunities to rank and bring in traffic from organic search, by adding more pages to Google’s index. Improves your rankings by talking about topics that are relevant to your customers. Maybe your research indicates that you should develop a beginner’s guide to cell phone camera lenses. This satisfies both the goal of adding more pages to your index and will likely improve your service page rankings, while serving as a great resource for prospective customers. Your research should be all-inclusive and very thorough to set you up for the best possible mapping opportunities. Make sure you’ve researched the terms your competitors are targeting, and be open to keywords and phrases that you might not use yourself. This especially is important for non-established verticals and industries, or if you’re launching new products. If no one has heard of what you sell, you’ll need to get creative and search for keywords that identify the pain point that your product or service addresses. You can do this by looking beyond the keyword itself, analyzing the intent of the search and mapping keywords to the buyers stage. When you sit down to plot this keyword map, you’ll want to start with the pages already on your website. If you’re aware of the content you already have on your page, and you apply relevant keywords, you’ll clear out a lot of the clutter in your research. Don’t worry about whether you will need to rewrite the content on the page for now—simply start your map by answering these questions: “What is this page trying to communicate?” and “How are people searching for it?” These two questions will help you narrow down keywords in your research that fit the content of the page and identify how people search to find that content. Use these keywords to effectively write your title tag, H1 and meta descriptions for each page, as shown in the example below. 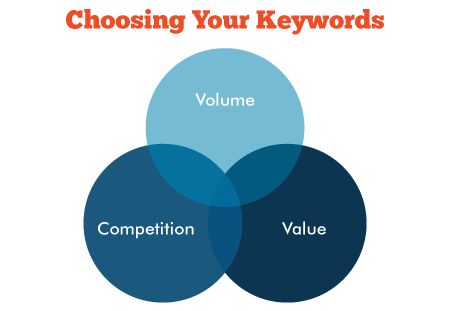 Once you apply keywords to every page on your site, take a look at your keyword research and analyze what’s left over. In many cases there are untouched buckets of keywords. These often are good places to start when planning new pages, blog articles and relevant on-site content to build your rankings. Figure out what those opportunities are and where they fit into your site navigation and site structure. After you’ve plotted out new pages in addition to the keyword mapping for current pages, it’s time to survey the land. This is where your competitive analysis comes back into play. Look at your competitors for anything you missed and to help develop your content strategy. They might be able to highlight areas you aren’t currently competing in, as well as opportunities where you can differentiate yourself. The goal of a keyword map is to organize the keywords customers use to find you, and assign them to pages on your website, create new pages to fill voids and blog about relevant topics. Once your on-page elements have been written and applied to your website, it can take a few days or weeks for Google to recrawl and organize. Eventually, you’ll be able to check your rankings for these keywords in either Google Webmaster Tools or a ranking tool like SERPs and see which keywords you are capable of ranking for immediately as opposed to those you need to spend more time optimizing and link building for. Having done your research and applied your keyword map to your website will outline your main SEO strategy. From there, new keyword opportunities and your current rankings will help structure an ongoing content strategy that supports your SEO campaign. To help you organize the brilliant content you’re planning to develop, download our content calendar guide and template. Previous Previous post: Why Does Digital Marketing Cost So Much?